The Executive Director of the Open to Hope Foundation, Dr. Heidi Horsley, talks to Bridget Park about losing a brother. Sibling loss is often a disenfranchised one. Park recommends leaning on your family and letting others love you and just be there for you. It’s tempting to push people away because you don’t want them to feel sorry for you. Being there for one another is critical. Parents worry when a teen doesn’t talk after losing their sibling. Parents think teens should talk, but Park says in her experience she was trying not to upset her parents. They don’t want to trigger emotion or pain for their parents, so they may reach out to friends. Involving a counselor can be a great help. Teens will go out of their way not to hurt their parents. They’re trying to be good kids, which is why they don’t grieve in front of their parents. There are many things that can help a sibling, starting with support. There’s no way to recover from something so tragic alone. Your parents can play a big role. They lost a child, but still have a living child and need to carry on with their lives. Teens shouldn’t be made to feel like a burden. 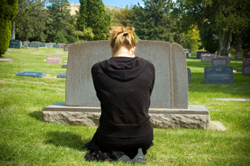 As a family, you can honor your lost loved one but should also prioritize moving forward as a unit. The surviving children need to live their life to the fullest. It’s also critical to carry on your brother or sister’s legacy—which is what they would want. Park urges teens to reach out and get support. She lives by the motto that pain is inevitable, but suffering is optional. Take it one day at a time, and know that some days will be tough.